Paper Crafts by Candace: SVG Cutting Files Challenge: Halloween! Happy 15th! Today is a new challenge day over SVG Cutting Files!! This months challenge is HALLOWEEN!!! 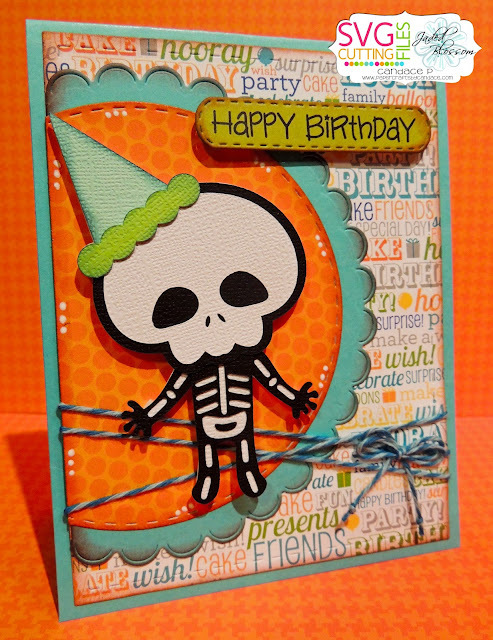 How CUTE is this new Party Skeleton from SVG Cutting Files?! I decided to do a halloween/birthday cross over card. From Jaded Blossom I used Card Mat Dies, Scallop Circle Dies, Stitched Circle DIes, Mini Tag Dies 2 and So Many Birthdays. love, love, love this card. The colors just make everything about this cute skeleton pop.